How to do market research ? Here comes the second phase of our 7-step methodology that we’ve spent 6 months developing. A white paper is available on our website (click here to access the introduction) that will explain you the whole market research methodology. 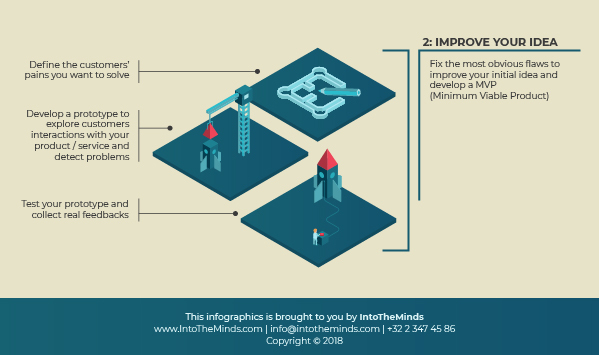 So today we discuss Phase 2 which focuses on improving your initial idea. In Phase 1 we discussed how to get informal feedback and gather additional insights through design thinking. Now comes the time to really test your idea on future clients. This step is about getting clear up your value proposition, describing the customers’ pains you have identified in Phase 1 (for instance during the Design Thinking session). We very much believe in the “power of writing”. Forcing you to write things is absolutely essential to get the essence of the problems which need to be solved and investigated through market research. Curiously, preparing a prototype isn’t necessarily seen as being part of market research. This is pity. There is a lot you can do with a prototype. Building it will help you realize whether your idea is feasible or not (first important leaning point). And having it will allow you gather so real and reliable feedback. A prototype is by definition a simplified version of the final product; something that hasn’t got all functionalities, all details, but is sufficiently near the reality to provide a reliable taste of it. Having a prototype available will help you see with your eyes how potential customers interact with it, what they do with it and the problems they experience. This is a stunning experience because no one can imagine beforehand how someone is likely to (mis)use a product or a service. Our habits very much influence the way we do things, impede our very understanding of how a product / service works. You have to see it in reality to realize everything that needs to be improved before your product / service is ready to make its way to the market. Is a MVP a prototype? Some people use the term “Minimum Viable Product” (MVP) and ask us whether it’s the same as a prototype. In our opinion a MVP is already an improved version of a prototype, once that has indeed the minimal characteristic to survive on the market and gain enough traction to sell. Happy reading and don’t forget to add or send your comment on Twitter, Linkedin or at the bottom of this article.